with exquisitely carved features. The Goddess Chenchu Lakshmi lives within this image of God as one with him. This is the tradition of every Hindu temple, the innermost chamber is called the garba griha or womb chamber and the Gods that dwell in this chamber have both the male and female aspects entwined within themselves. Thus they are able to give birth to positive energy to heal the people who come to them for succor. 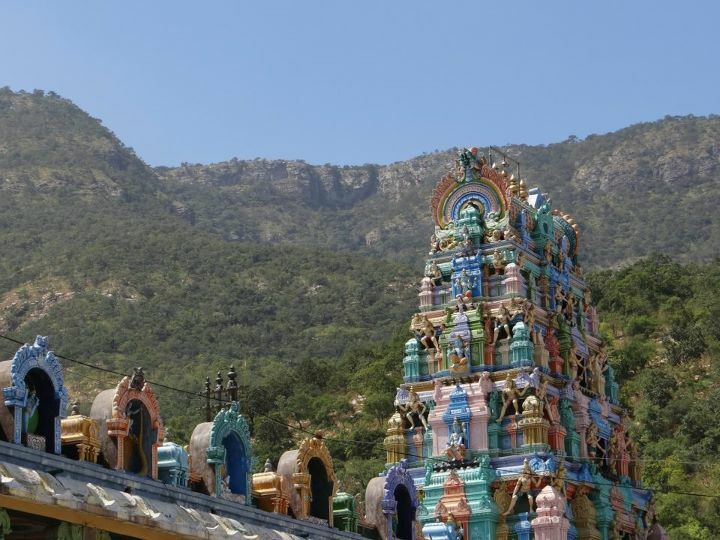 Before we enter the temple of Penchalakona, the most striking thing is its location against a backdrop of gorgeous hills. 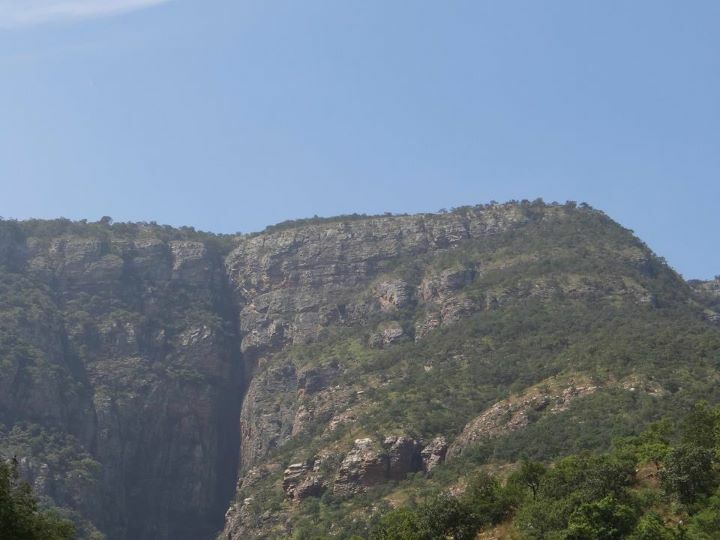 In Hindu tradition, hills attract and are a source of positive energy. When a temple is constructed on or in front of a hill, the positive energy of the hill reinforces the positive energy of the Gods within the temple. 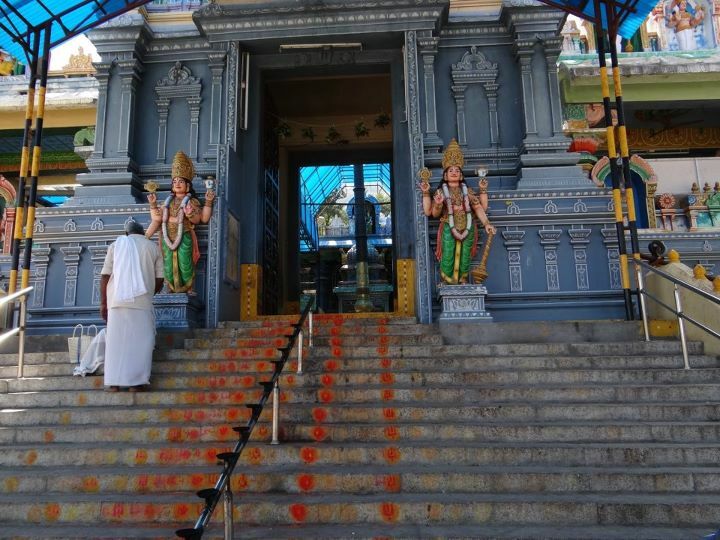 We are welcomed into the temple by a tall tower or gopuram. The height of the gopuram symbolizes the generosity of the local rulers who contributed money for the 800 year old temple's construction. Statues of lions sit guard over the entrance - a lion in Hindu culture is brave, loyal, and strong. Guardians called dwarapalikas or those who dwell in the door welcome us into the temple. 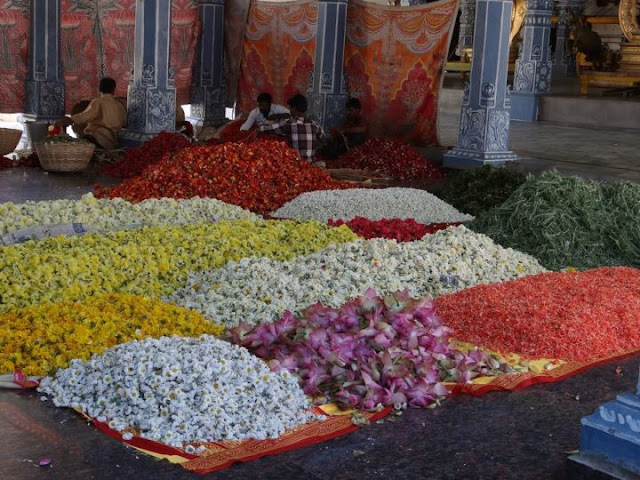 We enter the temple to be greeted by huge mounds of flowers used to decorate the God as well as serve as offerings to the God. These flowers are grown in a temple owned garden. 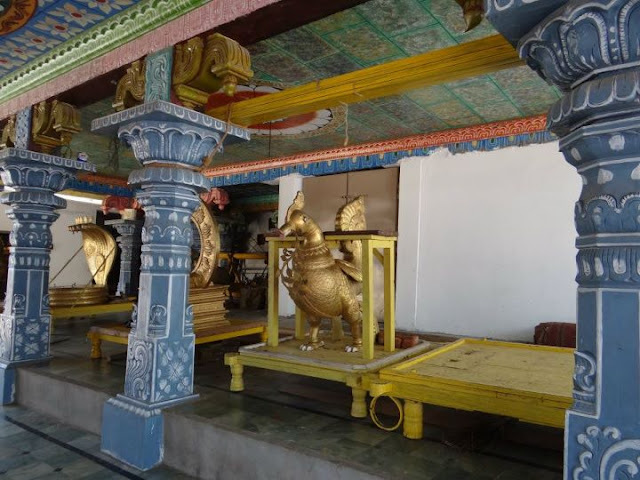 There are several huge bronze statues scattered around in the temple premises. These are called utsava murthys or images of celebration. 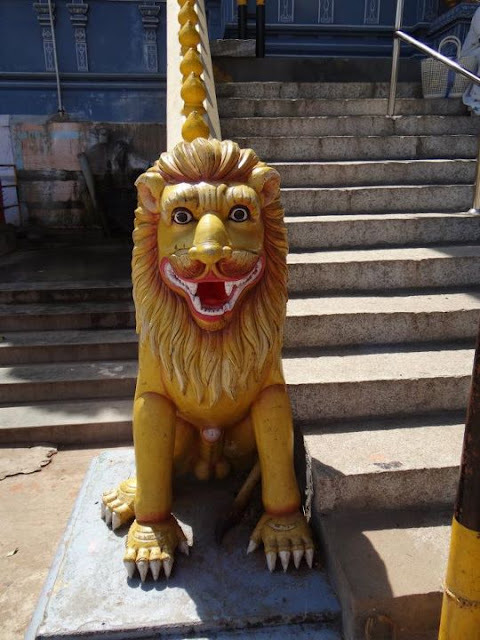 Once a year or more frequently, these images, which represent Lord Narasimha, are taken in a procession outside the temple so that all the people from local villages and towns can pray to the God who comes to their doorstep. It is not necessary for us to visit God every time, sometimes he comes to us. The garba griha is off limits to everyone except the priest who serves to draw the attention of the God to our prayers. The God's eyes are enhanced by bright paint on the bronze cover. This makes it look as if the God is looking at us directly. We make our prayers and leave. Outside the temple, there are several cows wandering about. In Hinduism the cow or gow is next to mother in her kindness and giving nature. The temple conducts early morning gow puja or prayers and feeds the 24 cows that live in the temple compound. Outside, we also see images of Lord Vishnu's symbols Shanku Chakra or conch and wheel. 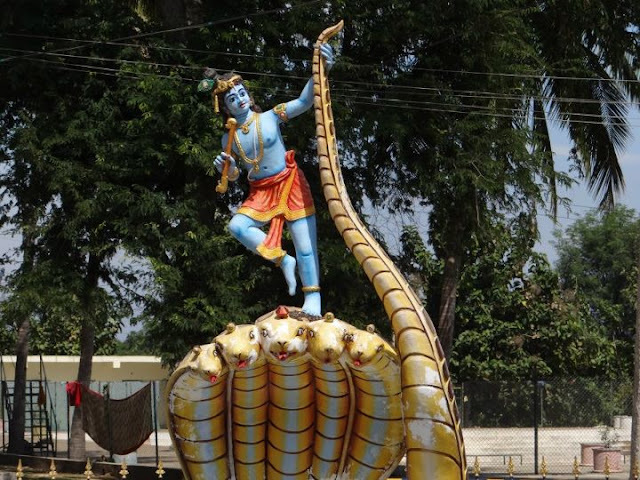 The child God Krishna plays with a serpant in another statue. All Gods are one but we can always picture our own favorite version of God. We left Penchalakona enriched by the positive energy of the temple and the hills behind it. 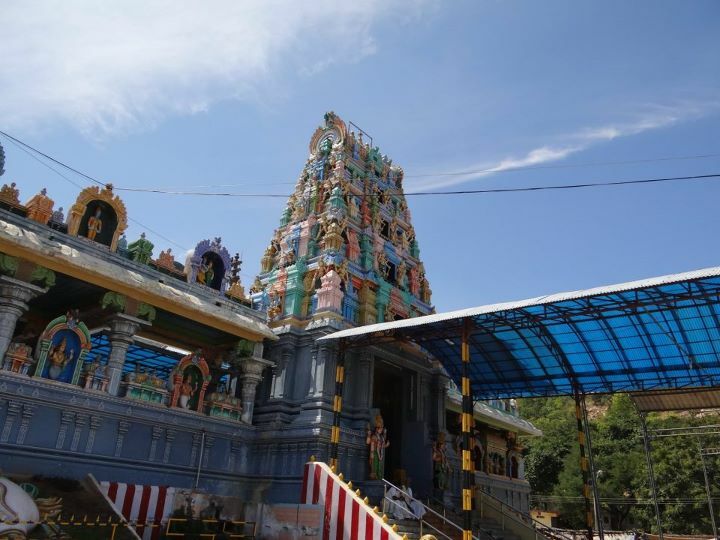 Penchalakona is about 90 kms from the town of Nellore in Andhra Pradesh. Thank you so much for this wonderful piece of writing Bharathi. Readers, please leave a comment if you have read this post and liked it as much as I did putting it together. 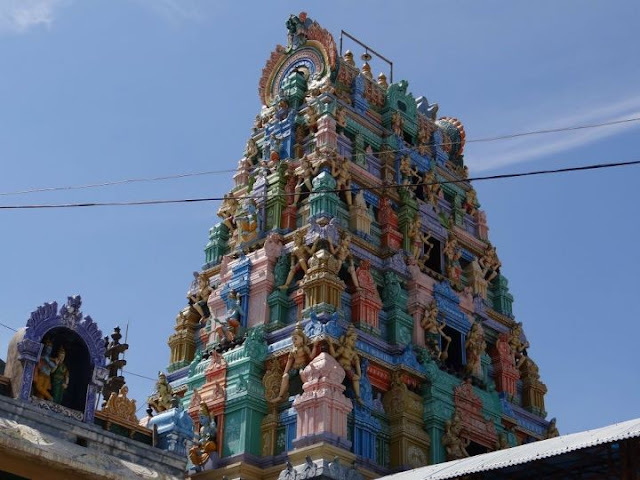 Vivekvedic Architecture are the one of the Architects with an tradition and religious works. We design all our religious structures in accordance to ancient Indian Temple Vastushastra. We are driven mostly by interest, our charges will be very nominal.